Senpai Matthew Matson began training in karate in January of 1999 while taking classes at Collin County Community College. In 2004 he got a chance to train with Sensei Doug Jepperson, another WIKF Instructor in Utah for 6 months. Back in Texas in 2005 Matthew helped the WIKF USA team stay motivated and training hard for the WIKF World championships that year, where he competed in Kata, Kumite, and team Kumite. He also became the team trainer for WIKF Texas. Also in 2008 he competed as a member of the WIKF USA team at the World Championships in Portugal. Under the instruction of Sensei Darrin Free and Sensei Brody Burns, Senpai Matson has competed in all levels of competition from Local, State, Regional, National, Pan American and World Championships. He has been a state and regional champion. Earning competitor of the year from the Academy of Classical Karate in 2005, and student of the year in 2002 and 2006. Finally achieving black belt after 7 years of training in 2006. 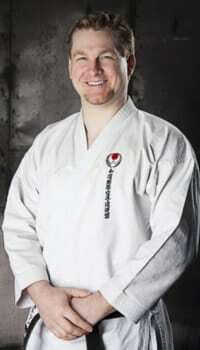 In 2008 he received an official WIKF assistant instructor license from Suzuki Sensei. In 2009 Matthew received his 2nd degree black belt (Nidan). In 2011 Senpai Matson competed with Chris Stratis in the WIKF World Championships in the first ever US team for Tanto Dori and Won Silver. He was also an alternate on the 2011 WIKF World Champion US Men’s fighting team, with Bryan Nixon, Tom Scott, Vincent Garcia and Cameron Sells. In 2014 Senpai Matson earned his 3rd dan (Sandan). Senpai Matson is certified by the National Academy of Sports Medicine in Optimum Performance Training, Sports Fitness Specialist, Integrated Flexibility Specialist, Performance Enhancement Specialist, and has a bachelor’s degree in Sports Management: Health and Wellness and a Masters Degree in Performance Enhancement and Injury Prevention, from California University of Pennsylvania. He also has certifications from the Cooper Institute in Bio-Mechanics, the National Federation of Personal Trainers, and the National Academy of Speed and Explosion. He was the team trainer, and floor coach for WIKF Texas competition team and a USANKF Certified Coach, until he decided to further his education. He is an Associate Faculty at Collin College in Plano Texas, and is currently working toward a doctorate in physical therapy.